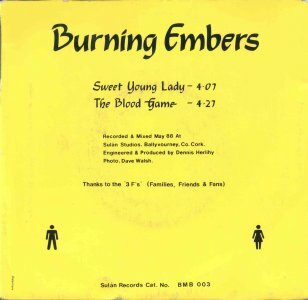 Burning Embers were a big hair pop band who deployed the stadium rock bombast that was popular in the mid-1980s. Their demo tape included "Champagne and Toffee", "Stay" and "Stormy Daze". Their singles saw them adopt a more commercial sound to little effect. Some who saw them live claim these singles don't do them justice. They were Carling/Hot Press finalists in 1986. Christine Utzeri regularly featured as guest vocalist, both live and in the studio. In fact she's listed as a regular member of the band on the press release reproduced below. She appeared on the first two singles "Now That You're Gone" & "Keep On Pushing". 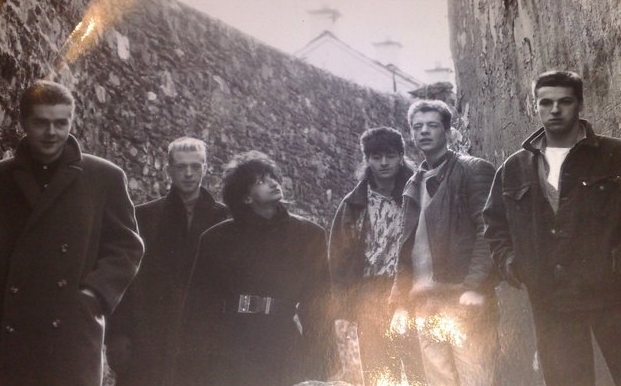 Sean O'Neill and Niall Macken guested on The Boy The Boy's debut single recorded at Sulan circa 1989. 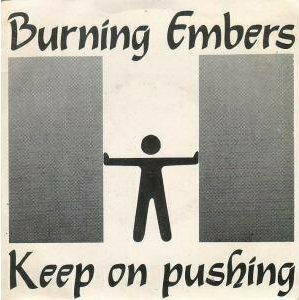 "Keep On Pushing" is a very appropriate title for the new single from BURNING EMBERS. The Cork-based six-piece have been piling on the pressure on the recording front with this speedy follow-up to their summer hit "Now That You're Gone", which is certrain to figure strongly in the critic's choices of Best Debut Single of '87. Two years ago Burning Embers went to London to seek fame and fortune. There, they had the good fortune to meet a young French lady called Christine, who joined the band and returned with them to Cork. The full line-up is Sean O'Neill and Christine Utzeri on vocals, brothers John and Neil Poland on guitar and bass, respectively, drummer Gordon Ashe and keyboards player Niall Macken. 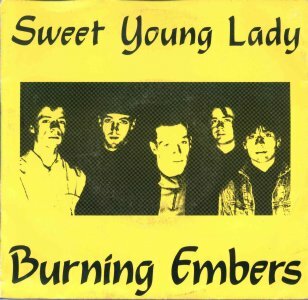 1986 saw Burning Embers emerging as a more cohesive and melodic force, only to be pipped by The Subterraneans for the Carling/Hot Press Band of '86 title. The competition led to a number of prestigious support spots, a TV appearance on RTE's "Megamix" series last January  and even more critical acclaim from top British music mag the NME. 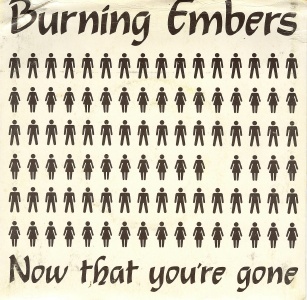 In June of this year came Burning Embers highly infectious debut single "Now That You're Gone" which made an indelible mark on the country's airwaves - staying on the Radio 2 Playlist for seven weeks. They also starred in last summer's Radio 2 "Lark By The Lee". In September, they travelled to London to record their new single, "Keep On Pushing" which was produced by Dennis Herlihy and released on the Cork-based independent label Nouveau Wax. 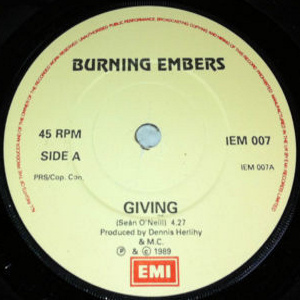 Burning Embers also took part in the Virgin Atlantic Irish Week at the Mean Fiddler in Harlesden and, as a result, have been offered return gigs, not only in London but throughout the rest of England as well. 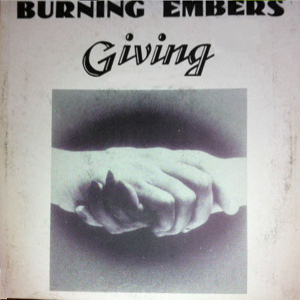 In the meantime, Burning Embers Keep On Pushing on the home front with a "Borderline" TV appearance and a Christmas tour to promote the new single, which should solidly establish the band as a new musical force to be reckoned with. 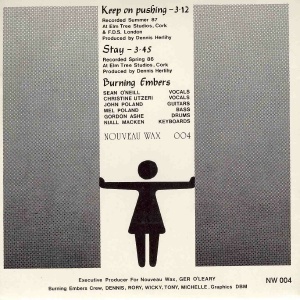 Recorded and mixed Spring 1987 at Elm Tree Studios Cork. A-side recorded Summer 1987 at Elm Tree Studios Cork and FDS London. 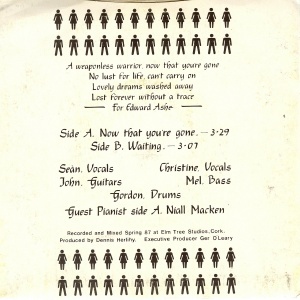 B-side recorded Spring 1986 at Elm Tree Studios Cork.